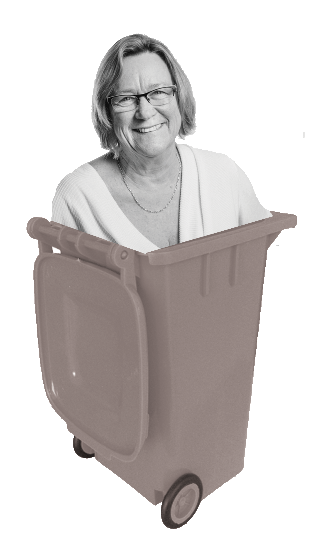 Yesterday, Cr Webster confirmed that she believes that residents should not be forced to pay through their rates for any waste collection services if they choose to use private services. We have welcomed the news - it is a big win for ratepayers in the local area. Cr Webster’s approach rules out the Council using targeted or general rates to cross subsidise Council refuse or green waste collection where there are alternative private operators providing a similar service or a ratepayer chooses to do their own waste disposal — such as farmers disposing their own green waste. Ratepayers will welcome this approach. It will ensure that any new service Council elects to provide will need to be cost effective and survive on its own merits in a marketplace where private sector competitors have equal footing. On this basis Rodney residents would only pay the direct costs of Council run recycling through their targeted rates (as there is no private sector option) with no hidden charge for refuse collection service or green waste collection. Councillor Webster said she supports a competitive market for refuse collection as currently in place in Rodney and will not support any Council entry into the market that is cross-subsidised from general or targeted rates. Our campaign called on Cr Webster to stand up for her local community, and it looks like she’s doing just that. Auckland Council is leaving it to private waste collection companies in North Shore and Albany - the very outfits it's trying to force out of the market with proposed reforms - to collect the Council's old 140-litre blue wheelie bins. In short, the Council dumped new recycling bins on homeowners, without collecting the old ones - telling residents they can do what they like with them, but making them wait months if they want the Council to pick them up. In addition, our supporters petition calling on Councillors Wayne Walker and Penny Webster to provide an opt-out provision for householders who don’t use or want the Council’s new services has received more than 2,100 signatures. More buses or more paint? No wonder Auckland is feeling blue. Auckland Transport is spending up to $9 million on repainting all public buses a uniform blue colour and wiping out vibrant, easily identifiable local bus colours at a cost of around $9 million. Auckland Transport’s demand that all buses meet its colour cost is set to cost ratepayers and travellers a lot more than loose change. According to an industry source, by the time a bus is prepared for painting the total cost is between $5,000 and $7,500 for a paint job which complies to AT’s new requirements. Add in the cost of having the bus off the road, and the total for the whole fleet comes to upwards of seven to nine million dollars. And we understand the costs are going up even further. The Council is now considering forcing bus companies to retrofit buses with AT embroidered fabrics on the seats. Wasting $9 million of ratepayers’ money to require private bus companies to paint out their local liveries shows how muddled AT’s priorities are. No wonder local communities are up in arms. Auckland Ratepayers' Alliance spokeswoman Jo Holmes said the move was "insane" and a "waste of money". "There are a lot more transport issues we could be spending that money on instead of painting buses." It showed how muddled Auckland Transport's priorities were, Ms Holmes said. "Auckland needs more buses, not more expensive council branding." Ritchies bus company owner Andrew Ritchie wasn't sure how many buses in his fleet needed the transformation because he was currently tendering new contracts with Auckland Transport. However, each upgrade cost $9000. "It's going to cost millions all up." Mr Ritchie said the bill would be passed on to ratepayers because the expenses are written into the contracts with Auckland Transport. "Someone's got to pay - we're charging someone and that will come back to the ratepayers." One of our members has also brought to our attention this video by Cr George Wood which provides further information about these expensive changes. 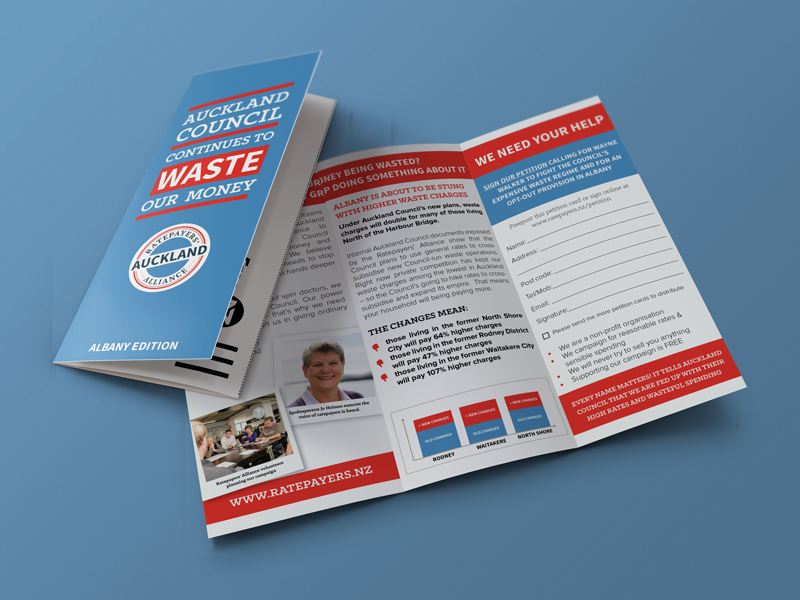 Ratepayers' Alliance members in Rodney have been in contact with us about the enormous effort Auckland Council is putting in to promote its new household waste services throughout Rodney and Whangaparaoa. Recent advisements running in the Rodney Times, and in a four page “Mahurangi Matters” pullout, the Council is spending our money telling us how great its new bins and services are. We’ve been having a look at the Council’s waste services. Next month we'll publish a report exposing how the Council plan will dramatically increase the cost to ratepayers. In the meantime we thought we'd take a look at the area covered by the old Rodney District Council specifically. "More efficient rubbish system for Rodney. 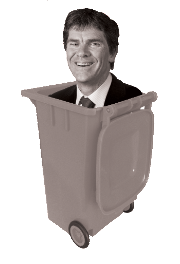 Several people have contacted me regarding the introduction of the large wheelie bins that will eventually replace the orange bags and smaller bins for rubbish collection. This will not be introduced in Rodney yet, but is coming. Having standard systems for rubbish and recycling collections will be more efficient and cost effective. Concerns have been expressed about long driveways especially in the country areas. Having talked it over with my colleague Bill Cashmore from Franklin where they introduced parts of this in the former Manukau City Council days, the suggestion is that the large wheelie bin stays just inside the gate while the small blue bin can still carry the rubbish/recycling to it in the boot of the car. I have been assured it works. Our research has found that the roll out of Council’s new waste plan will actually see Rodney ratepayers paying 50% more for refuse and recycling services. Based on dozens of official information requests from the Council, and figures from Council's Long Term Plan and Annual Reports, we’ve collated the table below which shows the forecast movement of waste charges. Costs of Council intervention in the competitive waste industry will see total rates increase by over $100 per year to well over $200 per year as the plan is rolled out. On top of this ratepayers will still need to pay Council or private operators around $104 per year (52 bags at $2 each). Also, it appears that Council may be using some of the targeted rates (intended for recycling) to subsidise the Council's refuse collection (which is supposed to compete against existing private providers). According to Auckland Council's responses to our information requests, the average household in Rodney will be paying 46% more by 2018 under the new waste regime than they paid in 2015, or 32% more than what it costs right now. Is this what Penny Webster meant by "efficient"? The Council’s charges mean that the costs per household, on average, will increase by nearly 50% between 2014/15 and 2018/19. The ultimate test for whether the Council's system is efficient is very simple - allow residents to opt out of their rates for the same service if they contract with the private sector. If the Council's services are the most competitive then no ratepayer will opt out. But Council won't let you opt out even if these services are being offered privately. This doesn't support their efficiency claim. The Council falsely says that its bags are cheaper than private alternatives but forget to tell ratepayers how much their rates will increase to pay for increased waste costs. The current private refuse collection services allow residents to choose between various size bins or refuse bags. Private companies also provide residents with choice on collection frequencies from once a month or weekly. It is not clear whether Council will even go this far with their more expensive system. Of course, Councillors Penny Webster and Wayne Walker were among the “Terrible Ten” who voted for Len Brown’s 9.9% rates hike. Click here to join our volunteer army which will be delivering leaflets in the coming months reminding voters of their voting record. Today we can reveal that Auckland ratepayers are being forced to fund some 250 professional associations and lobby groups thanks to the Council’s efforts to join and unduly influence the very bodies which seek to lobby it. It’s bad enough Auckland Council is funding the Chamber of Commerce and the Property Council. Now we discover the Council is funding the Bibliographical Society of Australia and NZ; the Public Relations Institute of NZ and even the UK Institute for Archaeology. We've asked, but the Council has refused to tell us, how much it has spent on the Property Council to date. It's not good enough. Ratepayers deserve transparency. Ratepayers will be aghast to learn how many overseas based organisations the Council has been funding with locals’ rates. Why on earth is the Council funding the likes of the Institute of British Engineers, the International Society of Automation, or the Oral History Association of Australia? No wonder Auckland planning is such a shambles. The tentacles of Council reach into every possible planning group effectively creating a line up of sock puppets. Look at the funding of the NZ Archaeological Association for example. This was the group which first blew the whistle on the fact that many of the Council’s Mana Whenua ’sites of value’ in the Unitary Plan don’t exist. The group has subsequently pulled back. How can groups such as this provide the necessary checks and balances on the Council when the Council itself buys its way into them? Today the Council votes on whether to keep funding the New Zealand Property Council, a lobby group whose very purpose is to hold the Council accountable on regularity and planning matters. How can they possibly perform their necessary function in an unbiased manner when one of their members is the very group they are supposed to be lobbying? We are proud to be one hundred percent funded by our members and supporters. We maintain ourselves as a strong independent voice by not accepting a cent of Council money. Now we’re calling on the Property Council, the Chamber of Commerce and Business NZ to hold themselves to the same standard.